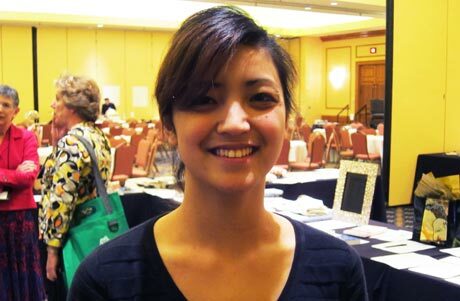 Have you ever heard of a “reverse TCK?” I hadn’t either, but after meeting Reiko Baumgarten, 24, at the FIGT conference, I’ve decided that I am one, too. A reverse TCK is someone who has grown up with the expat community, even though he or she has not moved a lot. I was born and raised in Japan for 19 years. I’m actually the reverse role of most TCKs. I didn’t move around, everybody else around me moved around. My experience was everybody moving. Why was everyone moving around you? My father is retired military, and we went to a military school [in Japan]. Everybody else was in military school — all the military brats that moved around to different places. So… do you “get” what it means to be a TCK? Oh yeah, definitely. Coming to FIGT, everything opened my eyes. …I feel what most TCKs feel, just from my experience coming abroad as well — since I lived in Japan, coming here [to the U.S.], the culture shock was so massive. I got engaged. My husband now… we met in Japan and he brought me over here, and thus begins our lives together. How do you deal with everyone assuming you are American? … It was hard at first but I live in such a close-knit community that eventually, everybody got to know me. What’s the best thing about being a TCK? To be able to walk up to somebody who has traveled the world — and just connect with them on a different level. …That’s what I love about being a TCK. Just being able to open up to others and share what you have. The loss, and being homesick. … When I first got here, I was crying for a good year. 19 years at home, and then moving away, it was pretty hard for me, especially since I was moving by myself. How do you think being a TCK will help you in life? I’m studying to become an anthropologist. …Being a TCK actually led me to my major and led me to know what I want to do with my career. … For my family, I would love for them to travel and have them be that TCK family as well. What advice would you give to other TCKs? Have a close network. That would be key for anybody who is a TCK. Being able to discuss, share, relate to anybody else — is probably the key thing to have. Without having that structure, you’re more likely to feel helpless and not be able to enjoy being a TCK. After reading this, I just realized I’m a reverse TCK too! Also, I loved what you said about how, as a TCK, you can automatically connect with someone else who else traveled the world. So true. However, as I started to read the article, I realise that I could potentially be a reverse TCK myself. The proper definition of it, that is. During my primary and secondary school years, I stayed in one international school. I saw friends come and go over the years, and felt the pain of “being left behind” more often than the pain of “leaving behind” people. Like you, it was on my 18th year where I had to move elsewhere for university that I started to feel the pain of leaving long-held sentiments behind. I also agree with having a strong network of people who can relate to TCKs, whether they have exposure the culture of TCKs or are TCKs themselves. Regardless of where I stay for the long-term, having that type of support system makes the adjustment process so much easier.